Hello summer. Let’s eat cake. Not just any cake. A French yogurt cake. Which is really a lighter version of pound cake. And by lighter, I mean less dense. Which might make it a half-pound cake. Maybe? Maybe not. It seems everyone has been talking about yogurt cakes for a long time. Even I made a yogurt cake last year, but I never talked about yogurt cake. 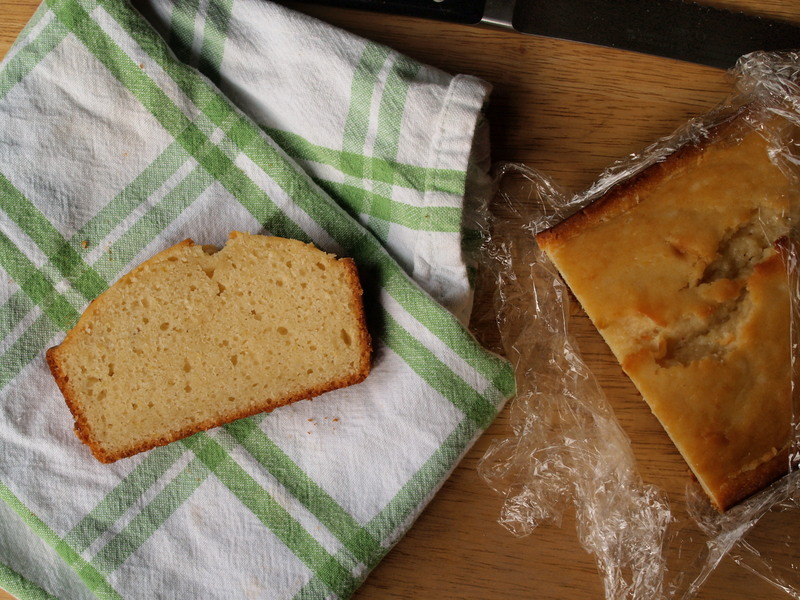 As lore goes, yogurt cake is one of the few cakes that French people actually bake at home. Seriously, would you bake cakes if you had access to the best pâtisseries and boulangeries mere steps from your kitchen? The French take their pastries very seriously – while a boulangerie is a bakery specializing in breads, a pâtisserie is a legally controlled substance, and can only be called such if it employs a licensed maître pâtissier (master pastry chef). Yes, licensed. The lore continues that this cake is so easy that children make it. It uses as a measuring cup a standard yogurt tub, measuring a half-cup. Two tubs yogurt, about one tub oil, two tubs sugar, four tubs flour, a smidge of leaveners, two eggs, a quick stir, and into the pan. If you’re like me, let’s also count the dishes to wash. One bowl, one spoon, one cake pan, one cooling rack. The yogurt tub goes right into the trash. I set out to test the lore because in my several summers spent in France, I never met anyone who baked this cake. I asked all of my French friends, every single one of them, and none of them have every baked this cake. Neither have their mothers or grandmothers. The only French friends of mine who have ever tasted a yogurt cake are the ones that I’ve fed. So yogurt cake is more folklore than lore, more fairytale than truth. It’s a cake that began once upon a time in a land far, far away. Little Red Riding Hood would carry it in her basket on the way to Grandmother’s house. The witch would feed it to Hansel to fatten him up. Snow White would bake it for the dwarves. Goldilocks would gobble it up while the bears were out on a walk. Fresh from the oven, the cake’s crisp golden top and crunchy edges give way to moist messy crumbs that cling to your fork. Once cooled, the cake slices neatly and its lemon-yogurt tart and tang intensify. The next morning, a quick toast revives the last few slices. They emerge with a dusting of caramelized crumbs that soak up a slather of butter. There may be no happily ever after, but this cake comes close. This is an easy, one bowl cake that doesn’t require a stand mixer, just a whisk and a spatula. I modified a recipe from Bon Appétit, adding a bit more lemon flavor with juice and replacing full-fat Greek yogurt with non-fat plain yogurt. The resulting cake rises a lot, with that classic pound cake golden hump and a cracked top. 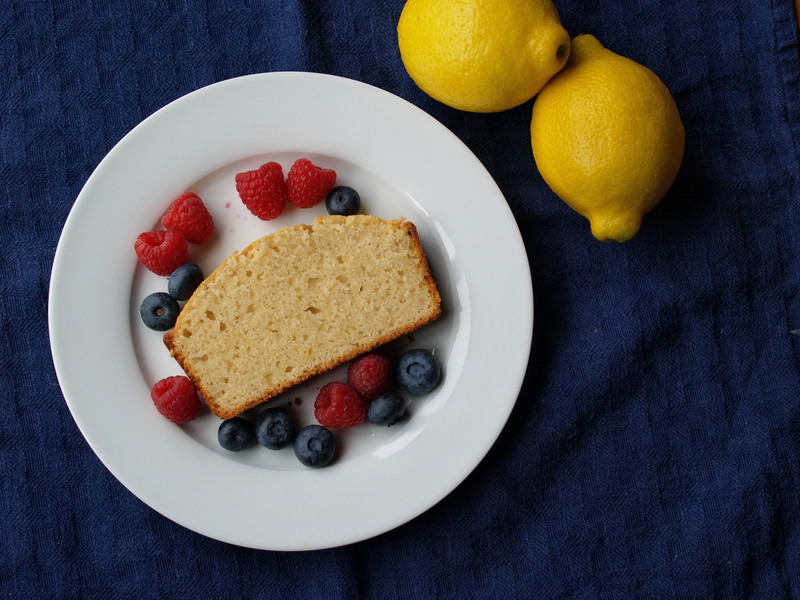 Serve it with berries – my favorites are blueberries and raspberries. The cake is great the next morning toasted and slathered with butter. Prep. Pre-heat oven to 350°F. Spray a loaf pan (8.5 X 4.25 or 9 X 5) with oil. Rub. In a large bowl, rub the lemon zest into the sugar with your fingers until really fragrant. This releases the oil in the zest and will make your cake really lemony. Whisk. Add the juice of the lemon, yogurt, oil, eggs, and vanilla and whisk until smooth. Stir. With a spatula, stir in the flour, baking powder and salt until smooth. Bake. Pour the batter into the pan and smooth out the top. Bake for 50-55 minutes until the top is golden and a toothpick comes out clean. Cool. Let cake cook in the pan for 15 minutes and then remove from pan and turn onto a rack. Let cool completely (at least 30 minutes) before cutting if you want pretty slices. Or dig in when the cake is still warm and clean up the cut edge after it cools (you know, so it looks pretty for company). I read recipes at the gym. While the shocking part of that sentence is the part about going to the gym, I’d prefer to talk about the recipes. You probably would too. It started innocently enough. Two weeks ago, I stuffed the most recent Saveur in my gym bag when I couldn’t find a New Yorker – my up-until-then preferred gym reading material. Trotting on the elliptical, I contemplated opening my own food truck. In between stretches, I dreamt of eating my way down Route 7 in France from Paris to Menton. Last week, I graduated to cookbooks. I started with Melissa Clark‘s In the Kitchen with a Good Appetite. 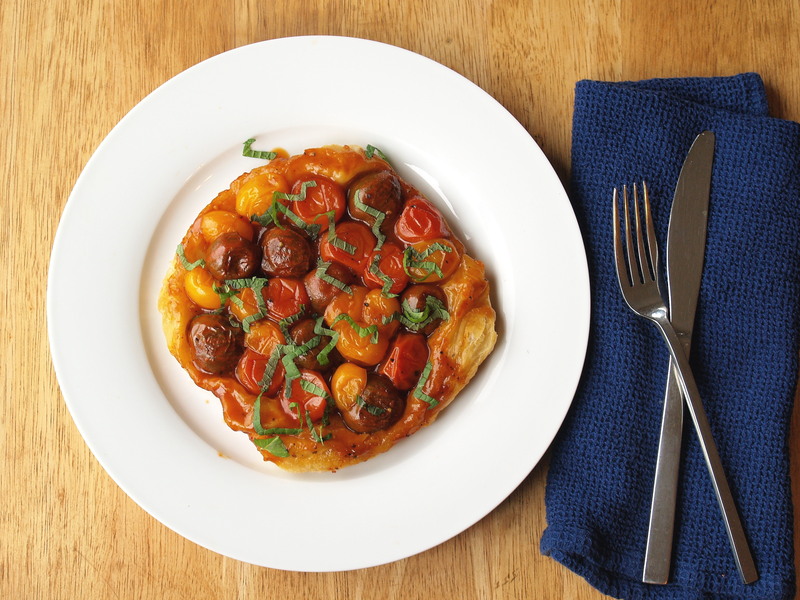 I had bought the book weeks before after making Clark’s tomato tarte tatin recipe. But when the box arrived and I ripped open the shrink wrap, my heart sank: there were no pictures. Not even a few glossy pages in the middle. Had I read the reviews, I would have know that. But I ordered it on faith with one too-easy click of the buy button. I placed it back in the box and tried to figure out who might soon be receiving it as a gift. The book taunted me from its lonely cardboard home, its spine not so much as cracked, its pages not dog-eared and splattered. It begged to be read. And, having avoided the gym for days with the excuse of nothing good to read, I lugged this 1-pound 14-ounce 444-page hardcover cookbook to the gym. I figured it would keep me company while pedaling and tone my biceps as I lifted it on and off the bike. Steadying myself and finishing my workout, I found dinner. As you can probably tell by the photos, I roasted carrots. I’m not going to suggest that anyone eat just than a big bowl of carrots for dinner, but if you were to eat carrots – and carrots alone – for dinner, these are the carrots to eat. You can roast almost anything to delectable results. 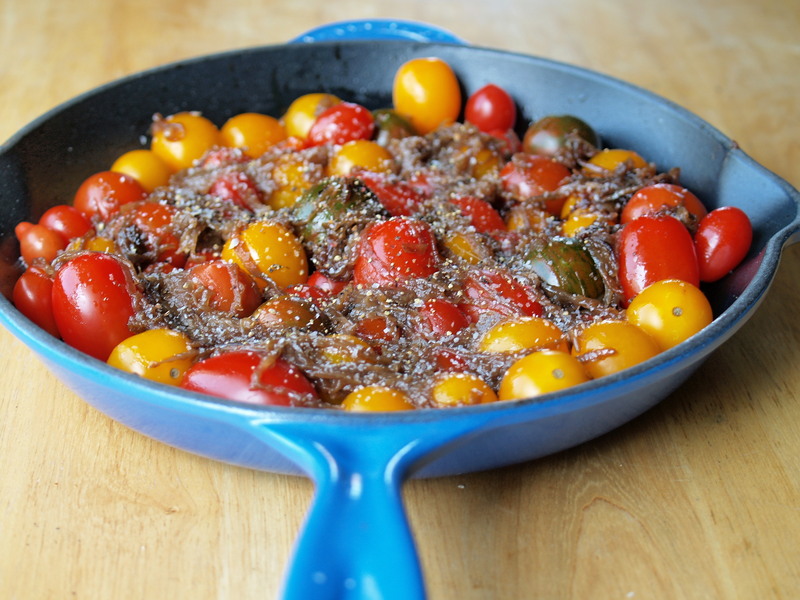 Just take whatever it is you want to eat, toss it with loads of olive oil and more salt than you think you need, and put it in a low-sided pan in a hot oven. While you unload the dishwasher or mash some garlic for a vinaigrette, your dinner will soften on the inside and caramelize on the surface, taking on that characteristic roasted, sweet flavor. It will condense and deepen in the heat, becoming more intensely itself in taste. Beets get beetier, broccoli gets broccolier. Under her tutelage, my own dinner of carrots got carrotier. As directed, I roasted the carrots with a smidge of red pepper and let them shrink and shrivel to the essence of their carrot-ness. Minutes before they were ready, she upped the ante by adding a drizzle of thick dark pomegranate molasses (syrup). 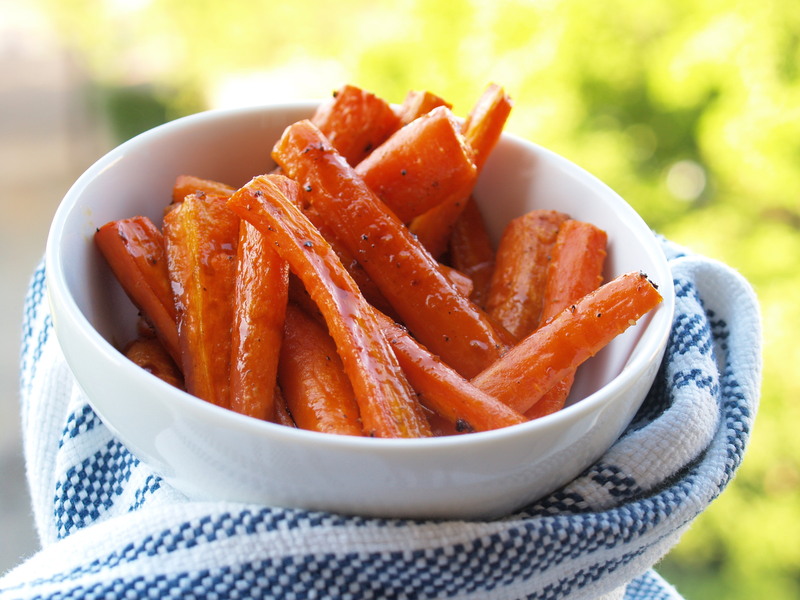 The pomegranate sugars caramelized and intensified the already carrotier carrots’ natural sweetness. As I raised one of these orange beauties to my mouth, a drop of still-hot pomegranate caramel burned my skin. No pain, no gain, right? It sure seemed worth it for these carrotiest carrots of all. And with that adage, I’ll be dragging my own Jane Fonda @## back to the gym to finish up the book. 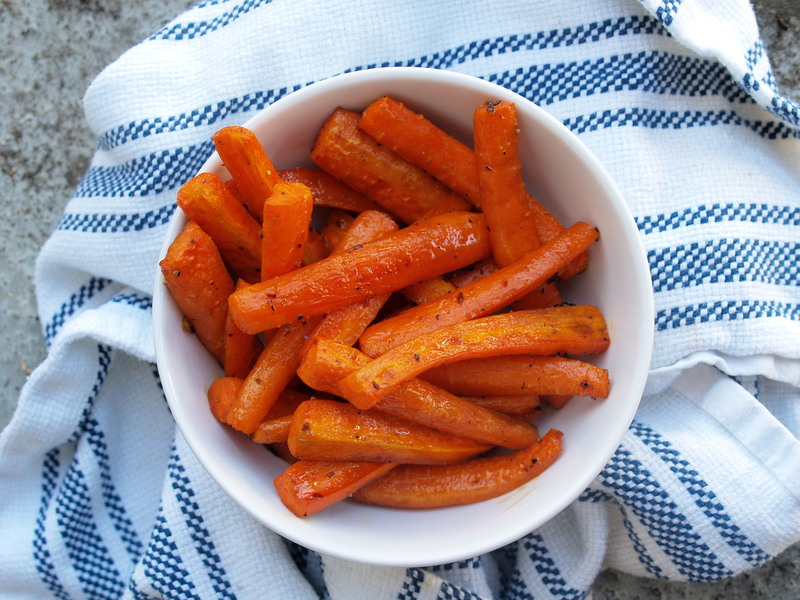 It’s hard to actually call this a recipe – instead I’ve provided guidelines and very approximate measurements for a single serving – a decent-sized bowlful – of carrots. I modified it from Melissa Clark‘s In the Kitchen with a Good Appetite. These carrots call for a few specialty Middle Eastern ingredients, and I’ve provided some easier-to-find alternatives. First we have pomegranate molasses, also called pomegranate syrup — is a very concentrated pomegranate juice Without any added sugar, it has a natural sweetness combined with a puckering tartness. You can make your own by boiling down pomegranate juice until very dark, thick, and able to coat the back of a spoon. In a pinch, you could also use balsamic vinegar either as is or boiled down to a thicker concentrate as well. If you do buy some pomegranate molasses or make your own, try it out in these other recipes: tomato tarte tatin, lahmajun-style meat sauce, and spoon lamb. The other specialty ingredient is aleppo pepper. This is a mild Syrian pepper that looks a little like red pepper flakes; if you can’t find any, substitute a pinch of cayenne pepper. Another tip – to avoid having to scrub caramelized pomegranate off of your cookie sheet, roast the carrots on a sheet of parchment paper (or aluminum foil) – you’ll thank me later. Preheat the oven to 425ºF. 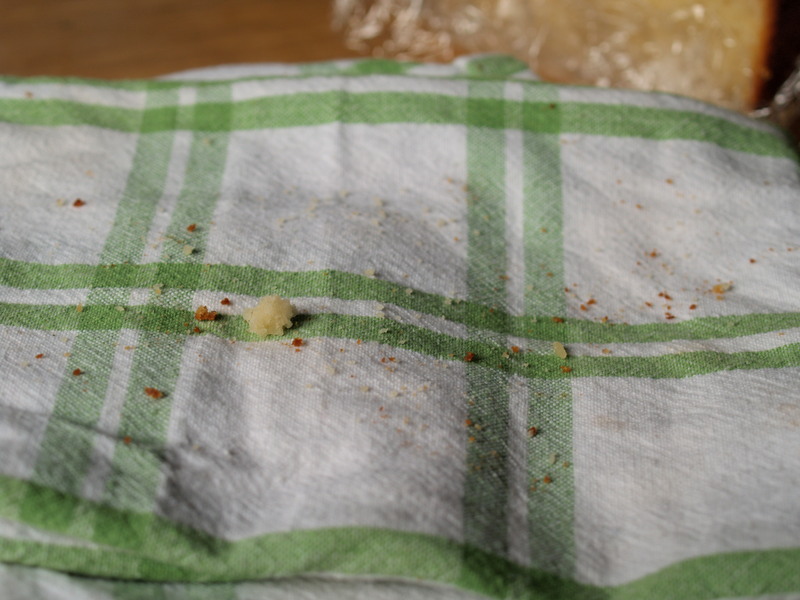 Cover a large baking sheet with parchment paper or aluminum foil. Peel 6-8 carrots, cut them in half width-wise and then in half or quarters lengthwise depending on how thick the carrots are. Try to make them all approximately the same size. 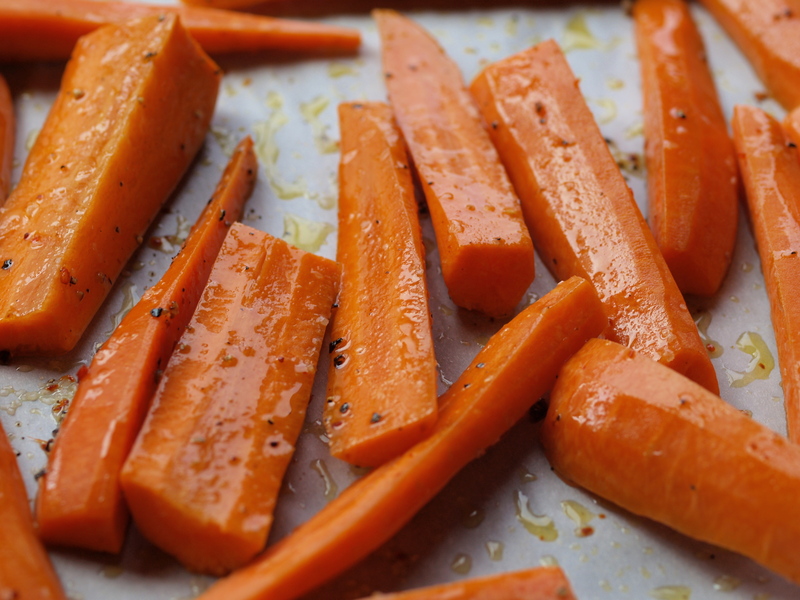 Scatter the carrots on the parchment, drizzle with 2-3 teaspoons of olive oil, 2 pinches of salt, a good grind of pepper, and a pinch of aleppo (or cayenne) pepper. Shake the pan to make sure that the carrots are evenly coated with the oil and spices and then spread them out in a single layer. 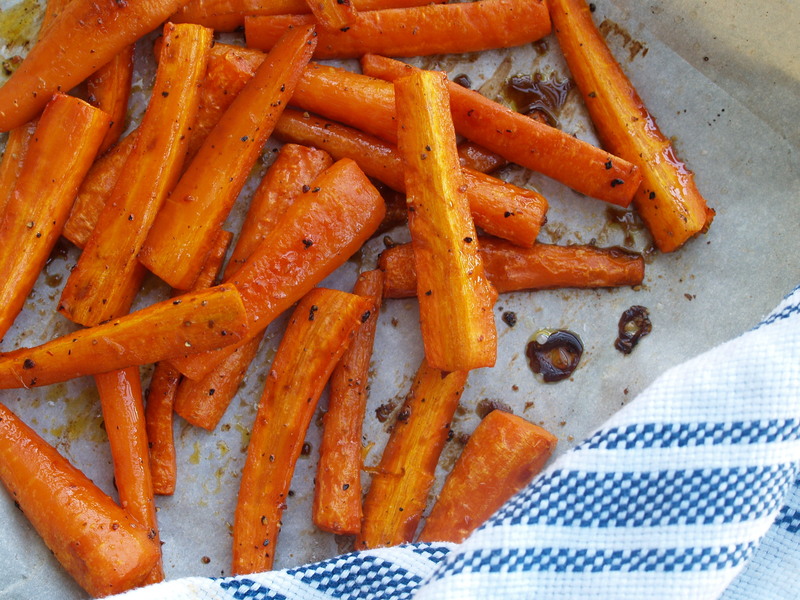 Roast the carrots for approximately 30 minutes total, with a few quick interruptions. After the first 15 minutes, shake the tray around (or just use a fork) again to stir the carrots so they’ll evenly roast. Ten minutes later, drizzle the carrots with 1-2 teaspoons of pomegranate molasses (or more to taste – the more molasses, the stickier/sweeter/tarter the carrots will be), and shake the tray around again to mix. Throw them back in the oven for the last five minutes. The carrots are ready when they’re slightly shriveled, soft but not mushy, and covered in a golden glaze of pomegranate. Really? 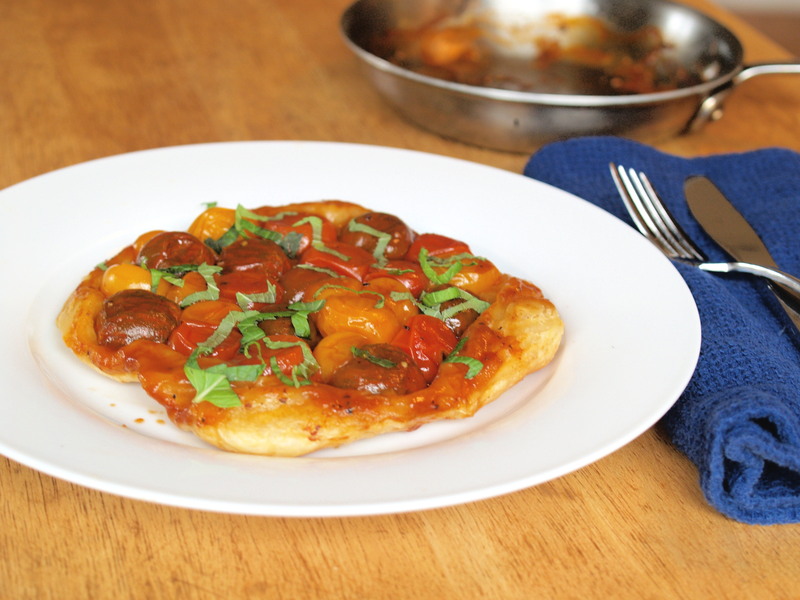 Another tomato tarte tatin? Yup. 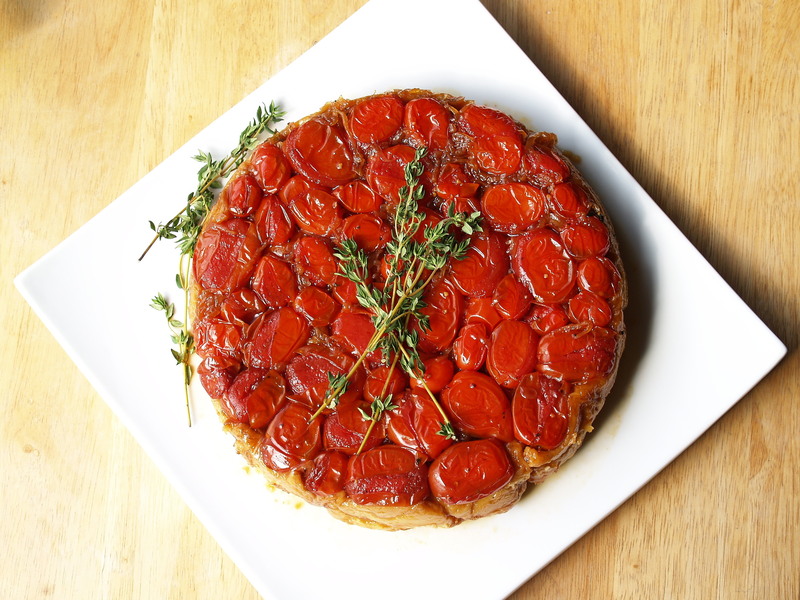 Another tomato tarte tatin. The first ones I made walked the line between sweet and savory. 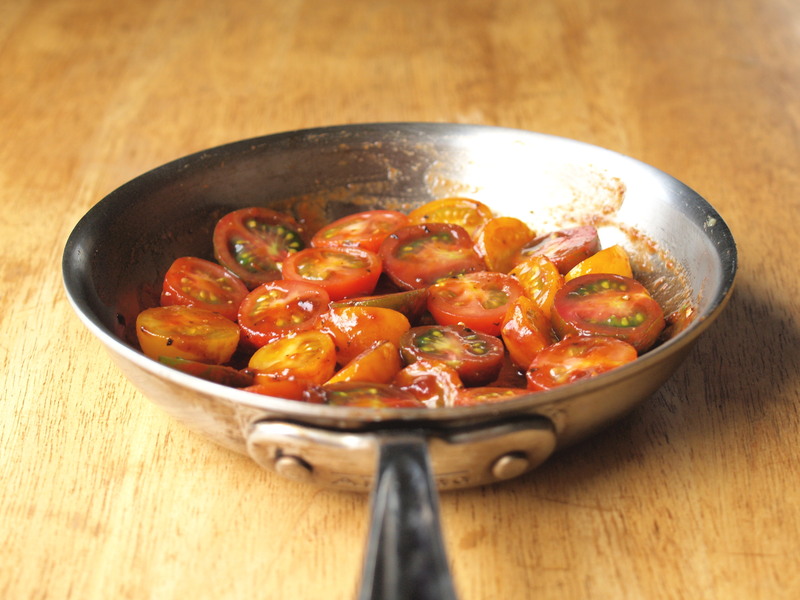 The tomatoes were bathed in a hot pool of caramel and showered with tangy balsamic. They were smothered with caramelized onions. And sprinkled with thyme. The flavors and textures scatted off one another. The whole tomatoes burst in your mouth. The soft onions melted into the crust that was drenched in enough caramel that we needed a few extra pieces of bread to sop it up. This next one was a whole other beast. And by beast, I mean a whole new beauty. I prepared it for an impromptu lunch with a friend who doesn’t like sweet with his savory and shies away from loads of balsamic. To keep the tang, I used pomegranate syrup, essentially very concentrated pomegranate juice the consistency of a thick, viscous, slow-pouring molasses. Not surprisingly, it’s sometimes called pomegranate molasses. 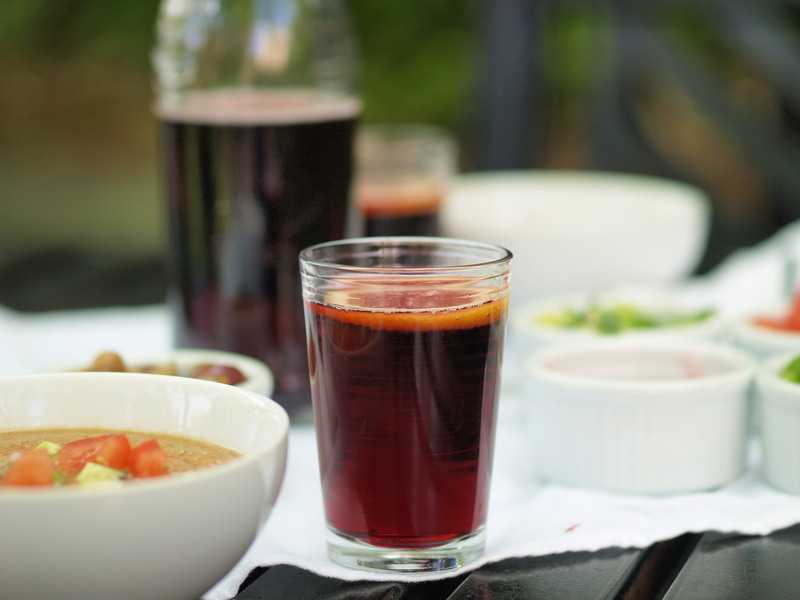 You can make pomegranate syrup yourself by cooking down pomegranate juice for about an hour. Many recipes call for adding sugar, but the bottle that I bought in Israel is just pure pomegranate and that’s what I used in the recipe, adding a pinch or two of sugar to taste. In order to intensify the tomato flavor, I added a little bit of tomato paste. Its natural sweetness serves as a nice counterpoint to the pomegranate. I decided to keep that sauce on the thicker side, thinning it out with just a bit of water, so that after flipping, the puff pastry would remain very crispy with no liquid to weigh it down. A dusting of mint gave the tarte a fresh, light flavor, cutting its intensity. The resulting tarte was like a good California Cab. Inky and jammy and slightly puckery. Coating your mouth with a rush of flavor. Able to serve as a meal of its own or to stand up to a good steak. I wouldn’t have been surprised if after lunch our teeth had turned purple. 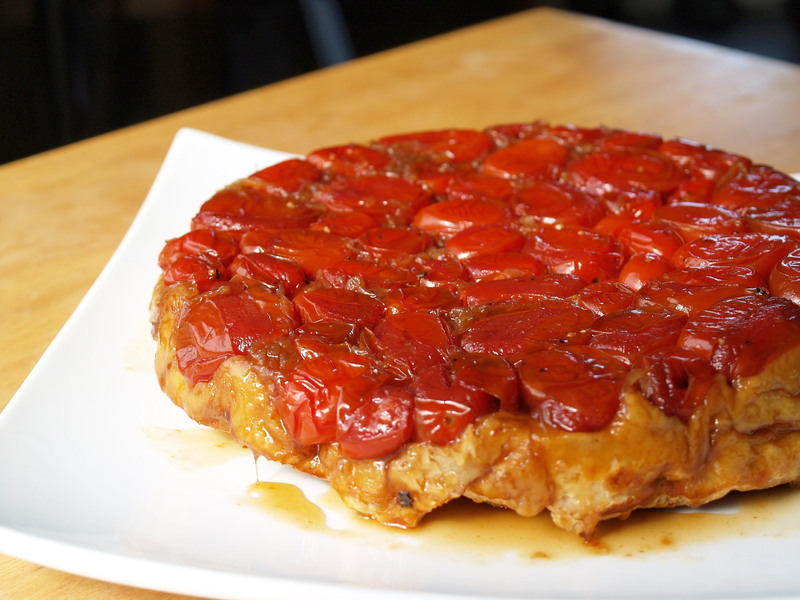 I have never seen a tarte tatin with this combination of tomatoes and pomegranate. It’s flavors were inspired by a traditional tomato tarte tatin, the flavors in lahmajun , and my favorite Middle Eastern condiments. Pomegranate syrup or molasses is very thick reduction of pomegranate juice. It should not contain sugar and is puckeringly sour. 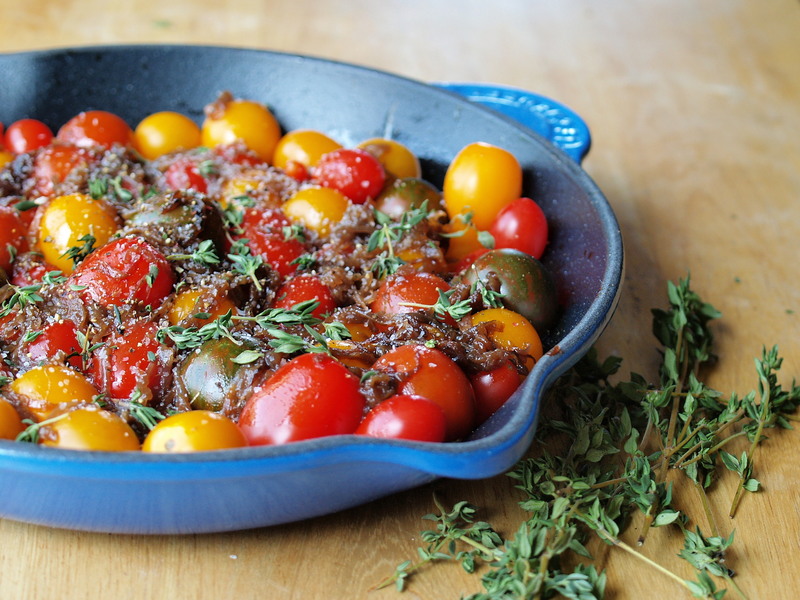 If you don’t have a tiny bit of tomato paste lying around, try tomato sauce. I rarely use an entire can of tomato paste in one sitting, so I freeze the leftovers by the tablespoon in ice cube trays and pop one out when you need it. 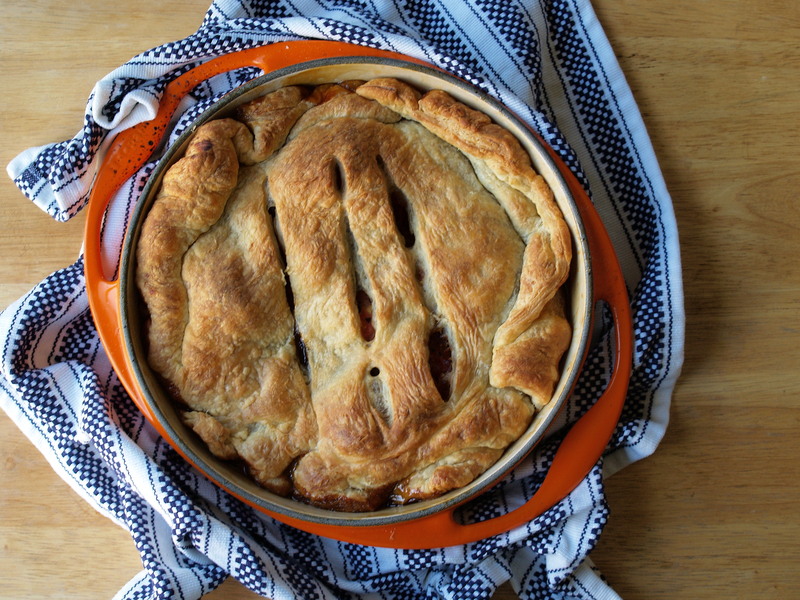 Eat the tarte lukewarm – be careful because the tomatoes will be hotter than you expect! Serves 1 as lunch or 2 as side dish. Prep. 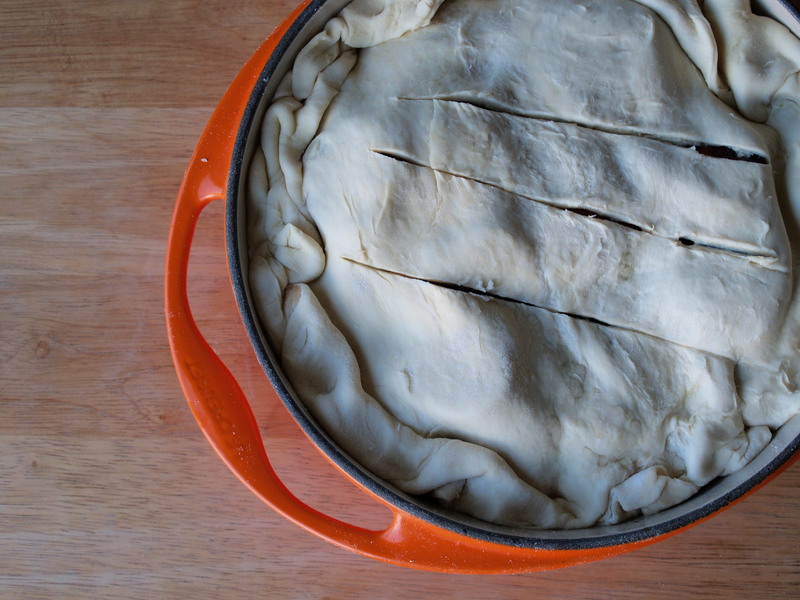 Defrost the puff pastry for 20-30 minutes on the counter, or overnight in the refrigerator. (Or, make your own.) Preheat the oven to 425ºF. Mix. In the small pan (5 inches across the bottom), mix together the tomato paste, pomegranate syrup, olive oil. Add a large pinch of sugar, a large pinch of salt, and several good grinds of pepper. Thin slightly with water until it’s the consistency of maple syrup. Arrange. 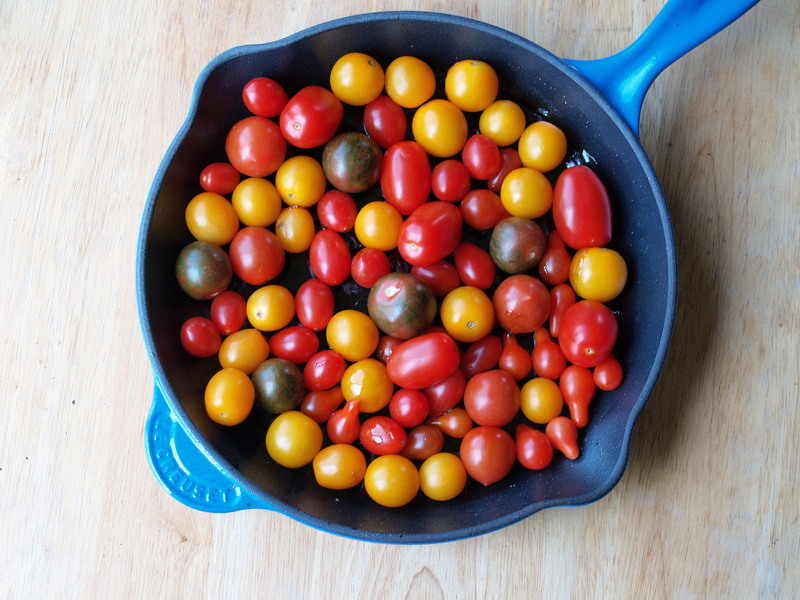 Slice the tomatoes in half through the core and toss them with the syrup in the pan. Arrange them, cut side up in a single layer. Roll. Roll out the puff pastry dough between two pieces of wax paper into a circle about 1 inch larger than your pan (so, 7 inches in this case). Tuck. Transfer the pastry to cover the tomatoes. Tuck the edges around the tomatoes. Cut several short vent in the pastry. Bake. 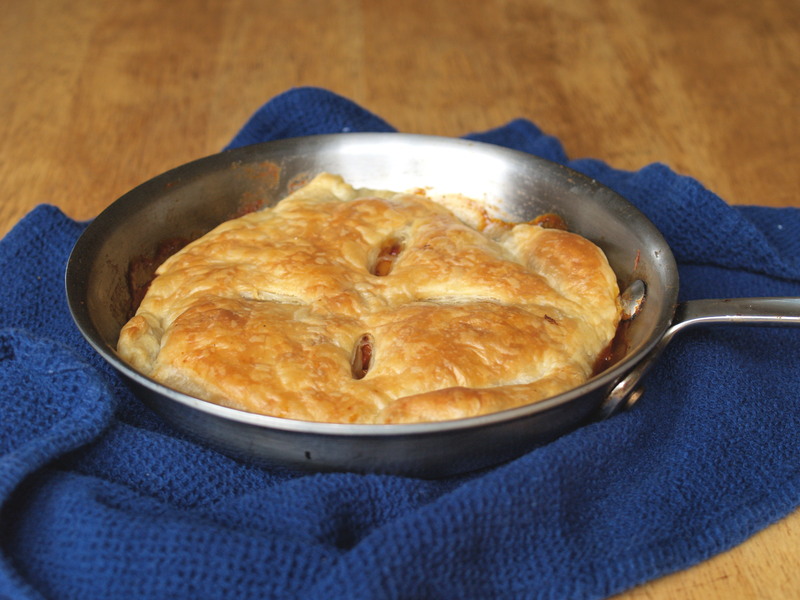 Bake the tarte until the crust is puffed and golden, 25-30 minutes. Flip. Let the tarte stand for 5-10 minutes. 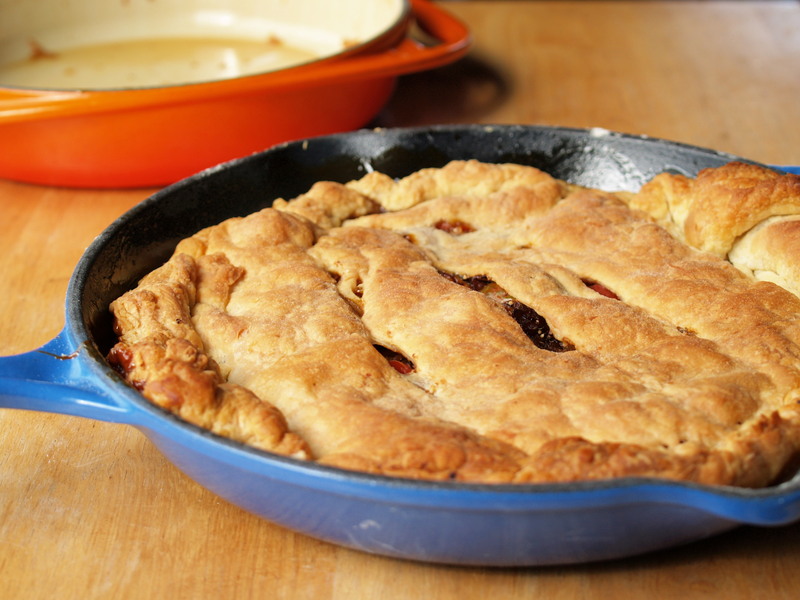 Run a knife around the pastry to loosen it from the pan. 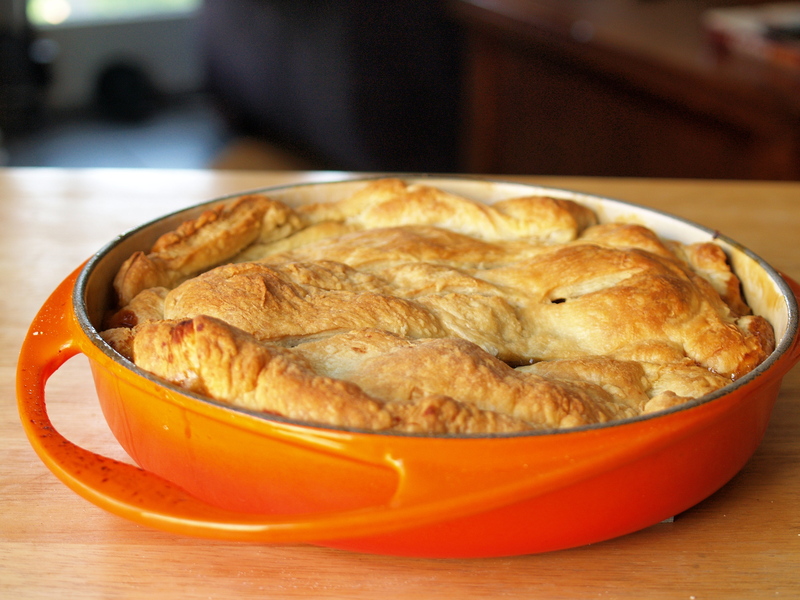 Place a platter on top of the pan and carefully flip the tarte over. Sprinkle. Thinly slice a few mint leaves and sprinkle them on the tarte. Make sure to eat it before the mint wilts.